Band leaders: Kay Kyser and his band, Bob Crosby and his orchestra. Opera singing Kathryn Jones (Grayson) leaves her mother (Astor) to live on base with her military father (Boles), who is a colonel. Kathryn is also hoping to convince her divorced parents to reconcile. While on base, Kathryn hopes to build morale on the military base before the men are shipped off to fight in World War II. She meets former acrobat Pvt. Eddie Marsh (Kelly), who is not cooperative and isn’t pleased with being in Army. He hopes to transfer to the Army Air Corp, until the two end up falling in love. The plot is a backdrop to a lavish military show Kathryn helps organize filled with comedic skits and music put on by MGM’s top contract players. -Eleanor Powell’s first color film. Powell’s contract was not renewed with MGM after this film, according to “A to Z of American Women in the Performing Arts ” by Liz Sonnebon. -Fifth role for Cyd Charisse and it is uncredited. After several small roles, Charisse was signed to MGM in 1946, according to Sonnebon’s book. -Fourth film role for Gene Kelly. -First film for concert pianist Jose Iturbi. Iturbi is one of many classically trained musicians that MGM studio head L.B. Mayer signed on to give the studio class. -Ranks number 29 in MGM’s top grossing musicals. “Thousands Cheer” made $3,500,000 in the box office, according to “The Rough Guide to Film Musicals” by David Parkinson. -Jose Iturbi. I enjoy seeing him in any film, whether he is acting or playing the piano. -Gene Kelly tap dancing with the broom. -Eleanor Powell in Technicolor. 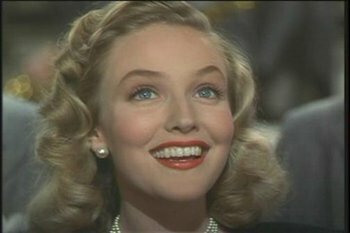 She again was filmed in color in her last film “Duchess of Idaho” (1950). 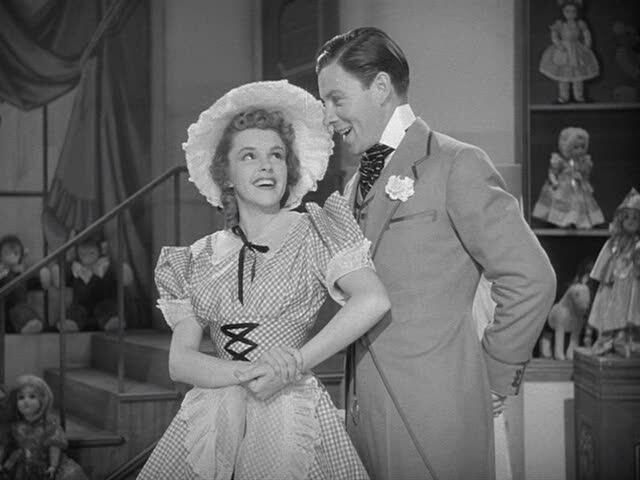 As I have mentioned in previous posts, there are several wartime films just like “Thousands Cheer” – a thin plot with a ton of musical performances by big-name stars. 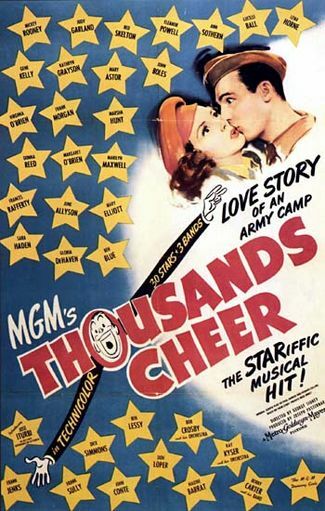 However, “Thousands Cheer” stands out against “Star Spangled Rhythm,” “Thank Your Lucky Stars” or “This is the Army.” Maybe it’s because of the caliber of the MGM stars that makes it more enjoyable. Or maybe it’s the Technicolor. But truthfully, I think it’s the way the film and the showcase of stars are structured. 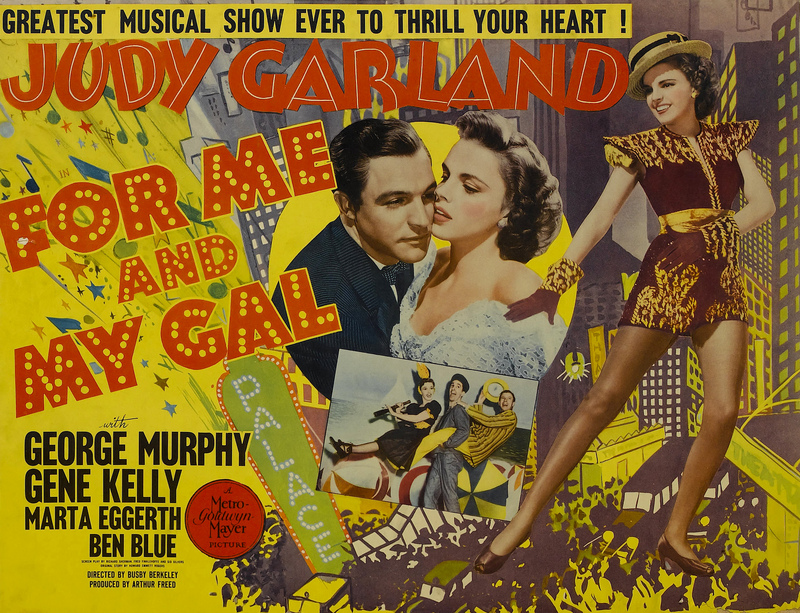 The first half of the film is a straight musical with a plot sprinkled with songs. The last hour to 45 minutes is roughly seven musical performances and skits designed as a show to entertain troops. The performances are shown as an actual show with Mickey Rooney as the emcee between each performance. “Thousands Cheer” holds a rare quality against other talent showcasing films-the musical performances don’t grow tiresome. I was entertained the whole time, unlike films such as “This is the Army,” where my finger was itching for the fast-forward button. All of the performances and songs are quality entertainment. Frank Morgan and Red Skelton’s skits are humorous and all of the music is fantastic. 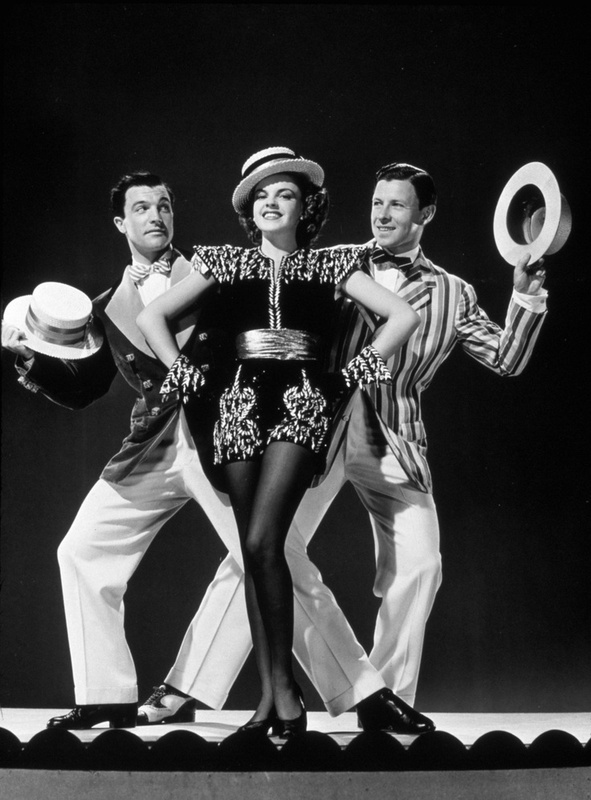 The two songs that I think bring down the house are Judy Garland’s “The Joint is Really Jumpin’ in Carnegie Hall” (which should be no surprise) and Kay Kyser’s band with his wife Georgia Carroll as the singer. Carroll’s glowing closeup almost makes the movie for me. This film is still early in Gene Kelly’s film career- this was his fourth film- but you can already see his star potential in his performance and the few dance numbers he was given. 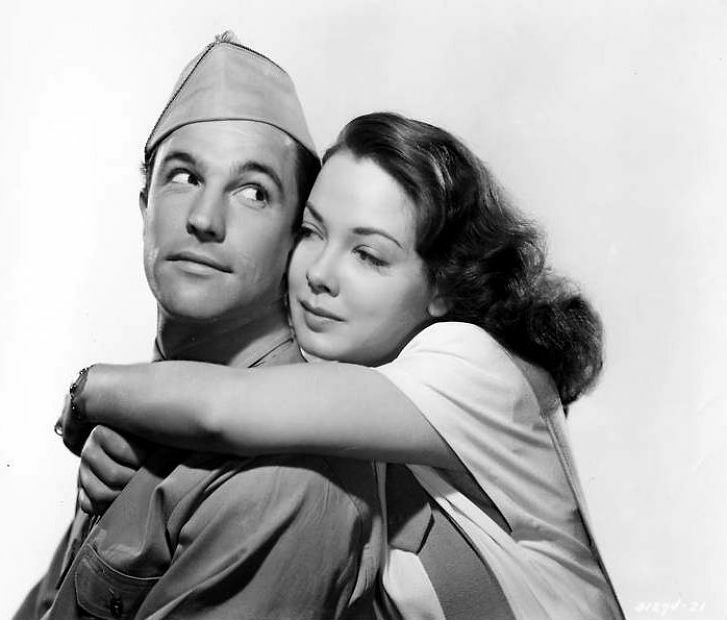 Kelly and Grayson also have good chemistry, and apparently, MGM agreed, pairing them two years later in “Anchors Aweigh” (1945). If you enjoy star spangled World War II films made for morale boosting and bursting with songs, this is for you. 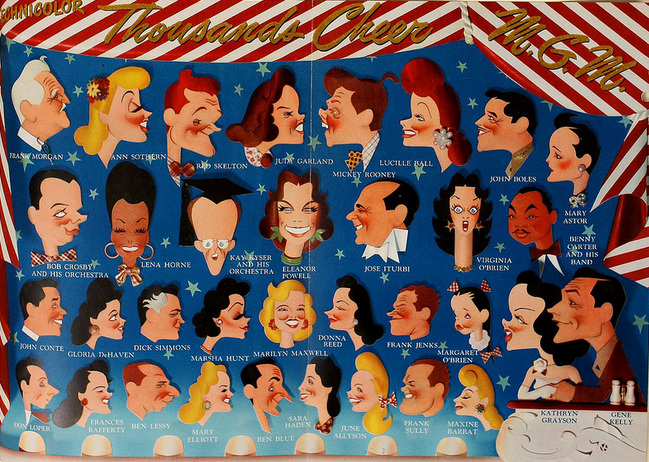 Fun promotional pamphlet of caricatures of the “Thousands Cheer” songs.